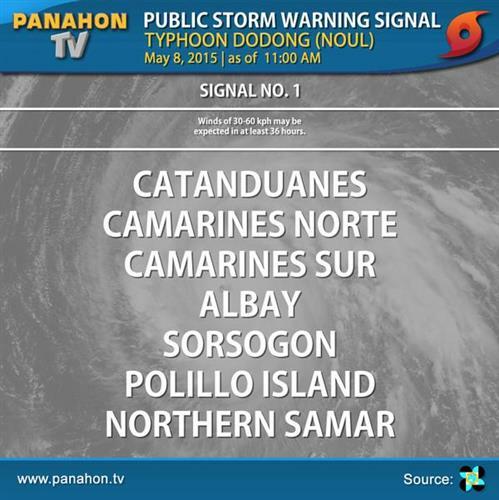 #DodongPH Location Update as of 2 PM | 425 km east northeast of Borongan, Eastern Samar. TC Update: as of 02PM today 08 May 2015, Typhoon #DodongPH was located at 425 km East Northeast of Borongan, Eastern Samar (12.6°N,129.2°E). #DodongPH Location Update as of 1 PM | 440 km east northeast of Borongan, Eastern Samar. ADVISORY | Expect Thunderstorm over Metro Manila (Quezon City, Marikina & nearby areas), Rizal, Zambales & Nueva Ecija w/in the next 2 hrs. TC Update: as of 01PM today 08 May 2015, Typhoon #DodongPH was located at 440 km East Northeast of Borongan, Eastern Samar (12.5°N,129.4°E). TC Update: as of 11AM today 08 May 2015, Typhoon #DodongPH was located at 470 km East Northeast of Borongan, Eastern Samar (12.2°N,129.7°E). #DodongPH Location Update as of 10 AM | 480 km east northeast of Borongan, Eastern Samar. 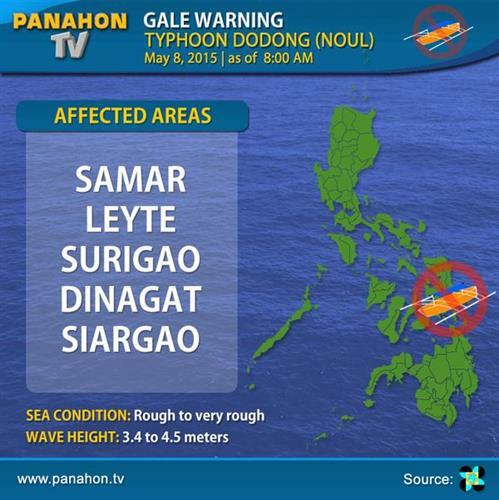 #DodongPH is located at 500 km East of Borongan, Eastern Samar as of 9 AM today. TC Update: as of 9AM today 08 May 2015, Typhoon #DodongPH was located at 500 km East of Borongan, Eastern Samar (12.1°N,130.0°E). 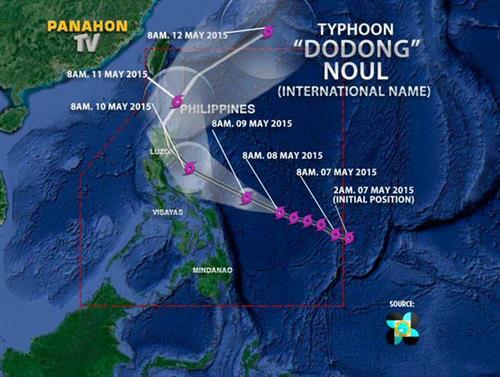 #DodongPH was located at 510 km East of Borongan, Eastern Samar as of 8:00 AM today, May 8, 2015. TC Update: as of 8AM today 08 May 2015, Typhoon #DodongPH was located at 510 km East of Borongan, Eastern Samar (12.0°N,130.1°E). TC Update: as of 7AM today 08 May 2015, Typhoon #DodongPH was located at 530 km E of Borongan, Eastern Samar (12.0°N,130.3°E). TC Update: as of 6AM today 08 May 2015, Typhoon #DodongPH was located at 555 km E of Borongan, Eastern Samar (11.9°N,130.5°E). 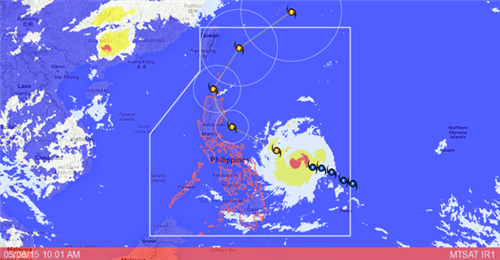 TC Update: as of 5AM today 08 May 2015, Typhoon #DodongPH was located at 575 km E of Borongan, Eastern Samar (11.9°N,130.7°E).